Certificates of Personal Achievement and Community Spirit with Cash Bursaries were Awarded on Tuesday, June 25, 2013. 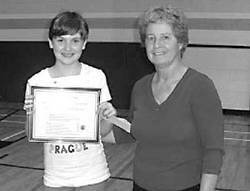 Receiving awards were: The 2013 female recipient (in Grade 6) receives the award from Optimist member Denise. and Optimist member Ray presents the award to the 2013 male recipient (in Grade 1). Congratulations to the two deserving award recipients who were selected from a list of worthy nominees put forward by school staff members. The club hopes this type of incentive for effort, achievement and concern for others will spur on students to higher goals and promising futures.